16 Days of Dairy & Egg Free Dinners! I took stock today of what meats I had in my freezer. At first I just wanted to know what was in there. 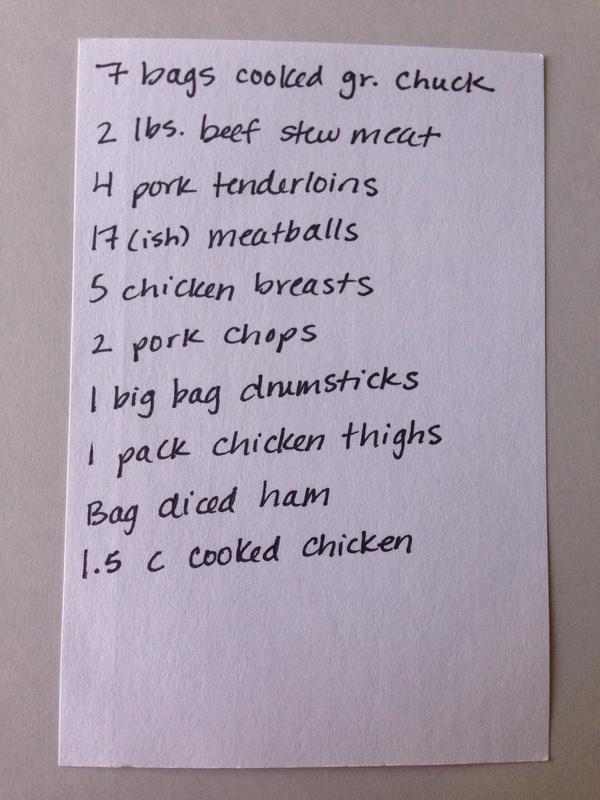 When I saw my list, I had this crazy idea of trying to only plan dinners based on what meats I have on hand. Of course, I’ll buy the fresh items needed for each meal. As you can see, we eat chicken, pork, and beef. SG tested negative to fish and shellfish, but I’ve yet to give her any. And I don’t like fish anyway. I digress. Here’s my list of meats in my freezer. All of these were on sale or were discounted. All SUPER deals! Click on this photo to see my printed menu. Here are the links to my dinners. Not all of them have links. Some of these recipes need adapting. If an egg is needed, I usually sub a flax egg. I sub almond milk or coconut coffee creamer for cow’s milk, and safe margarine or shortening for butter. Some of these recipes are tried and true, and some we’ve never had before. Friday (27th): Spicy Black Bean Burgers (P) or Grilled Black Bean Burgers (P) & grilled carrots, potatoes, & onions. I know I sometimes get stuck in a rut when it comes to our dinners. 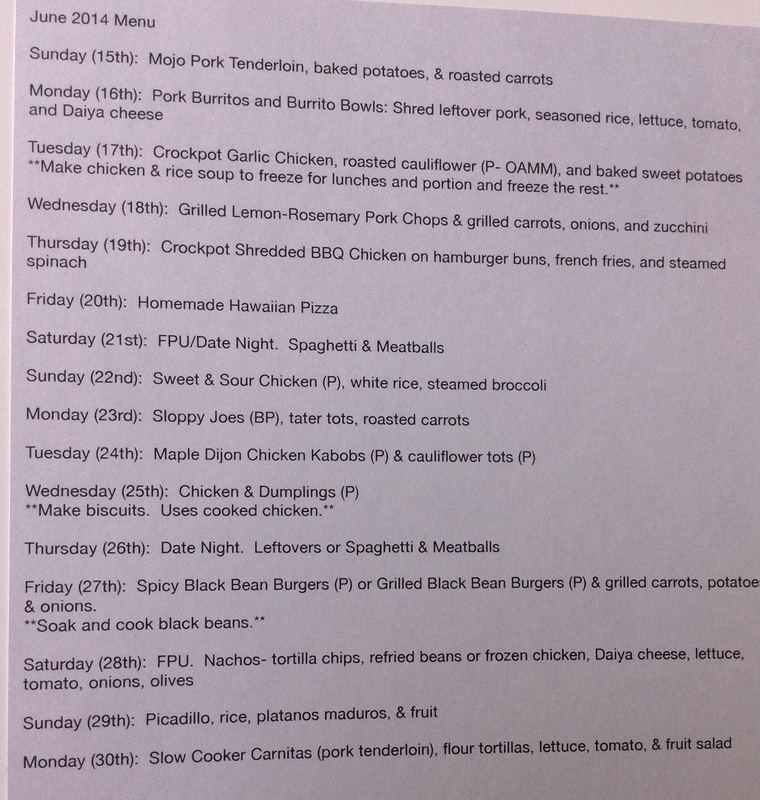 I hope this helps your dinner planning. My mommy (yes, I still call her mommy and I’m 35 years old!) makes the best pernil in the world! Pernil is a pork shoulder picnic roast that is marinaded in mojo (say mo-ho with a spanish accent) and cooked at a low temperature in the oven for several hours. The meat is scrumptious and just falls apart! I have not personally mastered the art of making pernil. I haven’t even tried. I do have a growing stash of pork tenderloins that I’ve scored great deals on and they are taking up space in my little freezer. It’s not quite the same as a giant roast, but nevertheless, my mommy suggested I marinate a pork tenderloin with mojo and throw it in the slow cooker. Only I didn’t use the bottled mojo like my mom does. I’m the crazy homemade lady so I decided to make my own. It was time consuming but worth it. 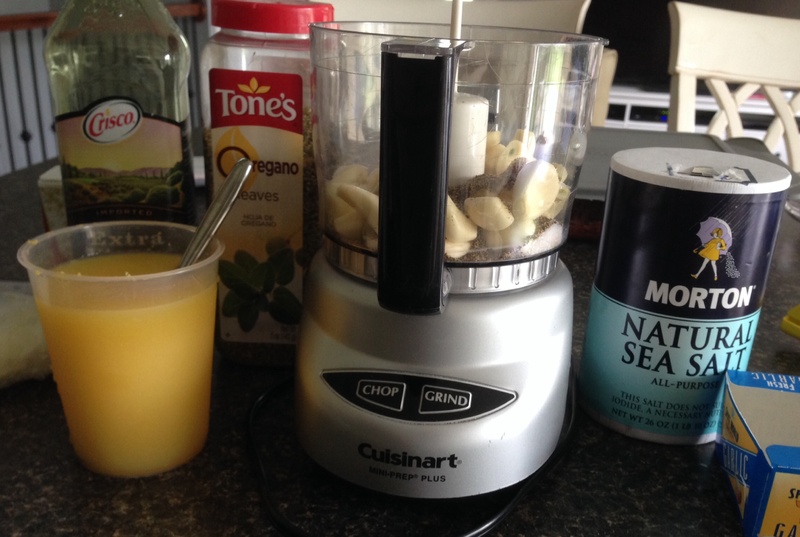 Here’s the link to the mojo recipe I used. I didn’t use peppercorns. The bottle at the store was almost $4 and quite honestly, I never use peppercorns. Shhh… I don’t like the grind your own pepper thingamajiggies. I know, I know… I said above I’m crazy. 🙂 But in a good way. Anyway, I subbed ground black pepper for the peppercorns. And I did make the soured orange juice with the addition of two freshly squeezed lemons. The mojo recipe yielded three cups of mojo. I did not need that much. I used one cup and froze the other two cups. 1. Put the tenderloin in the crockpot. My tenderloin was mostly defrosted but not completely. Sprinkle the top of the tenderloin with salt, pepper, garlic powder, and onion powder. Pour 1/2 cup of the mojo on the tenderloin. 2. Cook on low for 8 hours or high for 4-6 hours. My crockpot has pre-determined times as my only options so I cooked it for 6 hours on high. If you have the time, low is better. Halfway through the cooking time, turn the tenderloin over and pour another 1/2 cup of the mojo on the pork. 3. When the tenderloin is ready, shred the pork in a bowl with two forks. 4. Either mix the shredded pork back into the crockpot with the drippings and cooked marinade or make a gravy with the drippings from the crockpot. 5. To make gravy: Scoop out the drippings from the crockpot and put in a medium sized pan. In another bowl, add 1 heaping tablespoon of cornstarch with 4 tablespoons of cold water. Mix well. Add the cornstarch water to the drippings. Heat on medium low and mix well until the mixture resembles gravy. You may have to add water to thin out the gravy. Add salt and pepper to taste. If desired, serve the gravy over the pork. 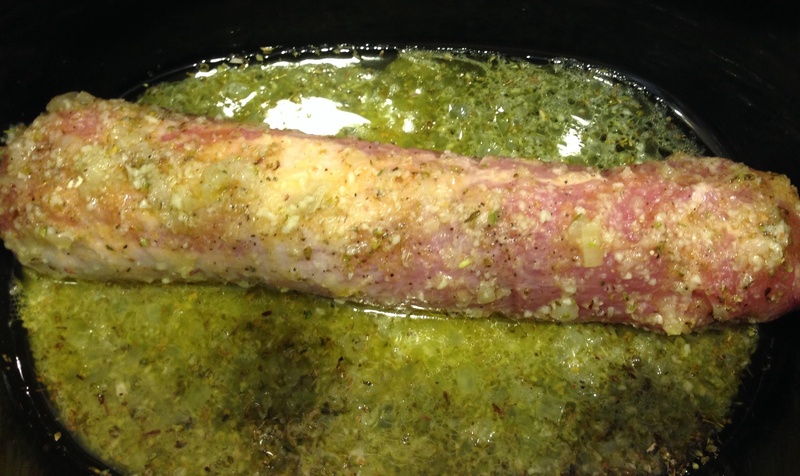 There you have it… my not quite pernil but a little taste of home mojo pork tenderloin. Since originally posting this recipe, I have made a few changes. I added one cube of my homemade sofrito. (Click here for the recipe.) I also turned the pork tenderloin several times throughout the day and basted it with the liquids with each turn. I then shredded the tenderloin in the slow cooker and let the pork soak up all of the juices and flavor. Oh my! It was even better this way!!! 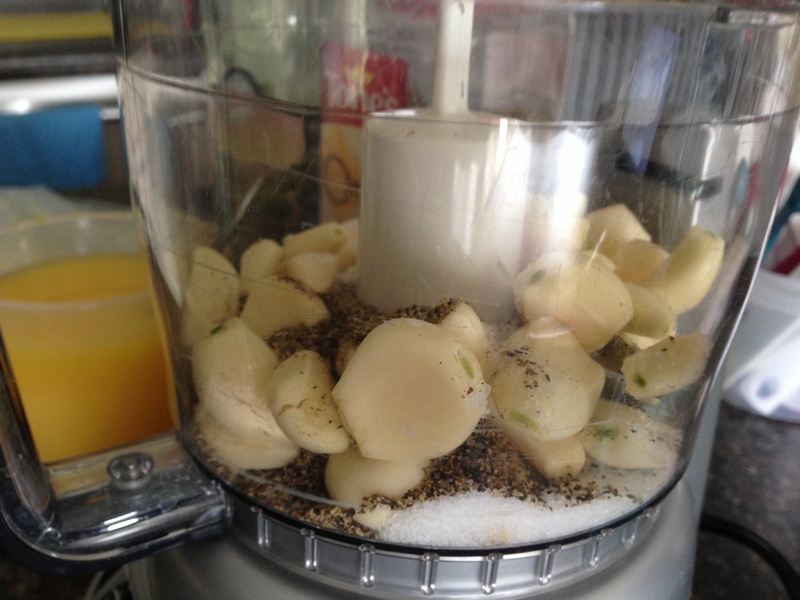 Yes, the recipe uses 3 HEADS of garlic!! This marinade would be equally delicious with pork chops. 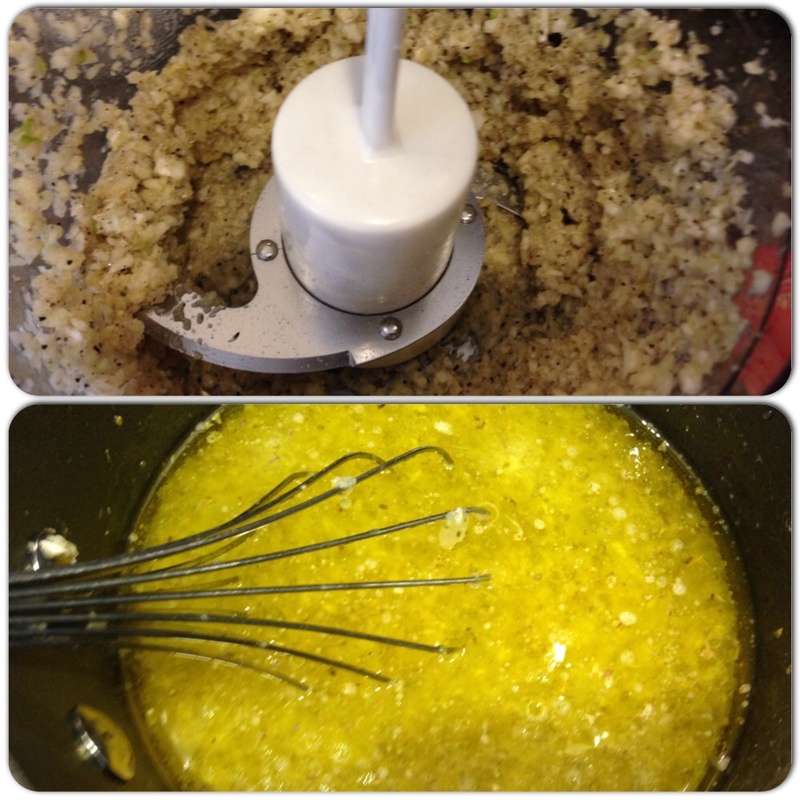 Marinate and then grill…Mmmmm… I must make that next!